BRADLEY, which began playing baseball in 1898, made its most serious bid for national attention up to that time in 1956 when Leo Schrall's hard-hitting team finished in a tie for third in the NCAA College World Series at Omaha. Finishing with a 24-8 record, the Braves hit .306 for the season, produced 19 home runs and a total of 87 extra base hits. Bradley scored 10 or more runs 16 times and were led at the plate by Del Bireline (Peoria Woodruff) who hit .434, Lee Utt (Decatur) .367 and a team-leading five home runs; Karl Gottlieb (East Peoria) .350 and Ed Taylor (Manual) .365. The team's leading pitcher was Wyman Carey, later to play minor league ball, who went 11-2 and produced 120 strikeouts in 113 innings and a 2.05 earned run average. After going 19-6 in the regular season, the Braves whipped Oklahoma A&M 13-10 and 16-12 to win the Missouri Valley Conference championship after finishing first in the Eastern Division with a 7-2 record. North Dakota State was bombed 11-2 to win District 5 and put the Braves in the World Series. Playing without Utt, team captain and most valuable player for the season, and Taylor, not eligible in the NCAA tourney because they were playing their fourth varsity seasons, the Braves edged Washington State 4-3 in the first round (Don Wyss drove in the winning run in the top of the 9th inning), fell to Mississippi 4-0 in their second game, kept alive with a 12-8 win over Wyoming and then were ousted 8-3 by Minnesota. Left to right: Bob Wright, Doyle Glass, Oscar Tharp, Wayne Steinke, Bob Gibson, Bob Hecker, and Coach John Moss. Left to right: Coach John Moss, Darrell Arnold, Chuck Reid, Oscar Tharp, Wayne Steinke, Bob Wright, and Doyle Glass. Left to right: Coach John Moss, Keith Sanderson, Chuck Reid, Bradley Ward, Jim Gorsage, Bob Wright, and Doyle Glass. 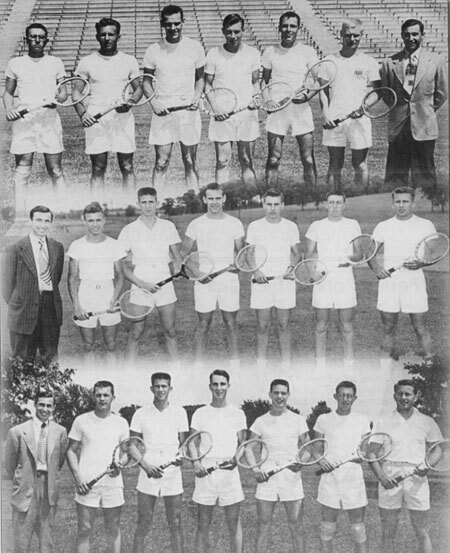 The 1950-51-52 Pekin Boys Tennis teams, coached by John Moss, compiled a combined 80-1-0 record with the `50 and `51 editions finishing 2nd, while the `52 team finished 3rd. 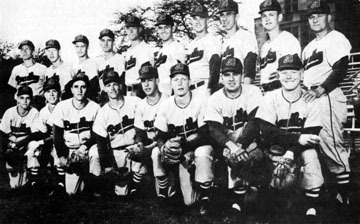 Those teams featured Doyle Glass, Bob (Buck) Wright and Chuck Reid.